Pursuit of Power® 2 launched a Kickstarter campaign on October 3rd, 2017! Birth of Shadows® was updated to version 1.9.10.6 on March 31st, 2017! Pursuit of Power® 2 was announced as the next game in development on July 7th, 2012! It will be released during 2018. Precision Games is an independent developer that formed during 2005. Our mission is to produce high-quality games with unique gameplay that challenges players. The games are all built on a custom engine that has been improved constantly since 2003. Major updates are regularly provided after release because we want to create the best experience possible for our customers. 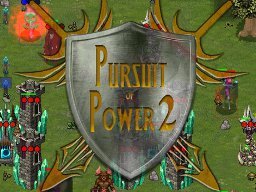 Pursuit of Power® 2 is a fast-paced real-time strategy game with pixel art. It will be released during 2018. You assume the role of a powerful leader, which can be a Shadow Knight, Stalker, or Mage. Choose ability upgrades for your leader as you gain levels. Dynamic world events. Manage fortresses. Campaign with objectives. Single and multiplayer skirmish. Learn the dark arts of a Shadow Knight to rescue your fiancee. Discover the cause of a plague that is ravaging the local towns. Slay enemies and destroy strongholds using an innovative combat system. Advance your character by gaining prestige, magic gems, and experience versus different creature types. Create new boards using a variety of content, including the option to add your own quests. Play these boards alone, with friends over the Internet, and share them with others. Pursuit of Power® is a real-time strategy game based in a fantasy setting. You assume the role of a powerful leader. Your main goal is to destroy all enemy portals and troops. Use your leader to blast enemy units with a comet, destroy a group of soldiers with a vortex, and heal loyal troops. Summon buildings and troops from your home world to dominate the universe. Watch as troops move through scenery and dynamically alter the fog-of-war, creating opportunities for ambushes and strong defensive positions. Use terrain carefully since it affects both troop movement and attack speed. 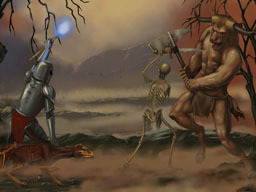 Battle through 17 campaign boards or play one of the skirmish games on a team. Join friends over the Internet.